Summer is coming to a close and as pumpkin spiced everything comes back in season, a lot of fruits are going out of season, including one of my all time favourites: Peaches. 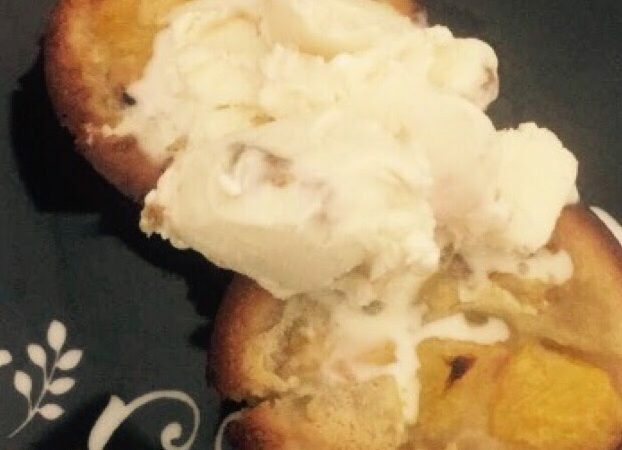 So today I am going to tell you how I make my easy mini peach cobblers, I have used this recipe for over a year and always got a great response. I know people do cobblers differently, some with a pastry top, some with crumble, but this is my way of making them. It’s literally the easiest thing I have ever made, which is probably why I make it so often. 2 ripe peaches, peeled and chopped into small pieces. Take your peaches and put them into a bowl with 3 tablespoons of sugar. This will help to draw out the juices. Set aside. Divide your butter and into your muffin tin compartments. Just over a pea sized amount in each should do. Put the tray into the hot oven and leg the butter melt. This should not take more than a couple of minutes so do NOT let it burn. In a mixing bowl combine the milk, sugars, flour, cinnamon and vanilla extract. Mix it with a spoon until it’s combined, it’s ok if it it has lumpy, you don’t need to mix it too much. Spoon the mixture into the muffin tins over the now melted butter, and put a couple of pieces of peach on top of each. The batter will rise and kind of embrace it as it cooks. Bake it in the oven for about 45 minutes until golden brown. Serve warm is a couple scoops of vanilla ice cream and enjoy it with the last rays of summer sunshine.